Former presidential advisor Ahmed ‘Sandhaanu’ Didi has accused Tourism Minister Ahmed Adeeb and Finance Minister Abdulla Jihad of illegally selling off Fushidhiggaru Lagoon in Kaafu Atoll without the knowledge of then – President Dr Mohamed Waheed Hassan. Speaking at a press conference today, Didi showed an agreement signed between the government and Ukranian company Prime Capital Pvt Ltd during Waheed’s administration on developing Fushidhiggaru. The former Special Envoy on Human Rights claimed Waheed only discovered news of the deal when the investors attempted to register a joint venture company at the Ministry of Economic Development, but said both ministers denied the move at the time. “I was at the president’s office then. Dr Waheed summoned Adeeb and Jihad and asked whether Fushidhiggaru lagoon had been sold off to a foreign party and they denied that any such thing was done,” he told the press. Neither Adeeb nor Jihad were responding to calls at the time of press. The Fushidhiggaru deal first came to light during the 2013 presidential elections, when current Home Minister Umar Naseer claimed Adeeb had sold off the lagoon without a transparent and public bidding process. JP coalition claimed that the agreement was compiled, signed and stamped without legal advice from the Attorney General, in the late hours of January 18, 2013, a Friday night. Despite Adeeb’s denial, local media in September 2013 reported that the Economic Ministry had refused to register a joint venture company for the development of Fushidhiggaru lagoon with Prime Capital. The company subsequently filed a lawsuit against the Economic Ministry at the Civil Court. Didi today said he has submitted relevant documents and letters to the Prosecutor General’s Office, the Anti-corruption Commission and Maldives Police Services requesting the matter be investigated. “This is the most deceitful and biggest embezzlement in recent Maldivian history,” he said. Didi was imprisoned in 2003 for writing and distributing a newsletter called “Sandhaanu” which criticized President Maumoon Abdul Gayoom’s policies. Former Auditor General Niyaz Ibrahim in November released a report implicating Adeeb in a US$6million corruption scandal. Adeeb has denied allegations, and accused Niyaz of colluding with MP and former Deputy Speaker of parliament Ahmed Nazim in releasing the audit report. Adeeb suggested Nazim had a personal vendetta against him following his refusal to support Nazim for the Majlis Speakership in May. Niyaz was subsequently dismissed from the post through a surprise amendment to the Audit Act, and Hassan Ziyath, the brother of an official implicated alongside Adeeb, was appointed as the new Auditor General. The Criminal Court on October 26 withheld Nazim’s passport on allegations of blackmail while the Supreme Court today held the first hearing into an appeal of the High Court’s acquittal of Nazim from four counts of corruption. The High Court has today accepted a complaint lodged by former Auditor General (AG) Niyaz Ibrahim challenging the appointment of his replacement. Niyaz was dismissed from his job when President Abdulla Yameen on Monday approved Hassan Ziyath as the new AG hours after 59 MPs voted in his favour. The ruling Progressive Party of the Maldives (PPM) had pushed through a surprise amendment to the Audit Act on October 29 requiring the AG be reappointed within 30 days. Niyaz’s lawyer Ibrahim Riffath told Minivan News Niyaz could not be dismissed half way through his seven year term through an amendment to the Audit Act. “Article 215 of the Constitution clearly sets the AG’s term to seven years. Niyaz was appointed in May 2011. Further, Article 218 states the AG’s position only becomes vacant if the incumbent resigns or through a no confidence vote by the People’s Majlis,” he explained. Niyaz has also requested that the High Court issue an injunction on the enforcement of the new amendment. Prosecutor General (PG) Muhthaz Muhsin has questioned the timing of the Auditor General’s Office’s release of a special audit report of the Maldives Marketing and Public Relations Company (MMPRC) implicating Tourism Minister Ahmed Adeeb in corrupt transactions worth US$6 million. Muhsin told Sun Online yesterday that the report’s release on the same day (Thursday, October 30) that President Abdulla Yameen ratified amendments to the Audit Act that could see Auditor General Niyaz Ibrahim replaced was questionable. The timing of the report’s release would create doubts and questions among the public, Muhsin said. “I am not questioning the status of his post,” he added. The Progressive Party of Maldives (PPM) meanwhile issued a press release on Thursday contending that the report was politically motivated, “baseless” and intended to defame Adeeb – also the party’s deputy leader. The ruling party condemned Auditor General Niyaz Ibrahim for basing the report on “falsehoods”. The opposition Maldivian Democratic Party has meanwhile called on the PG to prosecute the tourism minister for corruption and abuse of office. Tourism Minister Ahmed Adeeb has denied allegations of corruption in a special audit report of the Maldives Marketing and Public Relations Company (MMPRC) while the opposition has called on the prosecutor general to press charges. The report (Dhivehi) – made public on Thursday (October 30) – implicated Adeeb in corrupt transactions worth US$6 million between the MMPRC and the Maldives Ports Limited (MPL) and the Maldives Tourism Development Corporation (MTDC). The MMPRC obtained MVR77 million (US$5 million) from MPL to be paid back in dollars and US$1 million from MTDC as a loan, which was immediately transferred to two companies – Millenium Capital Management Pvt Ltd and Montillion International Private Ltd, both with ties to Adeeb. Speaking at a press conference at private broadcaster DhiTV’s studio last night (October 31), Adeeb insisted that the MVR77 million was not a financial loss to the state, noting that US$3 million has been repaid to MPL with the remainder due in December. “Under my [tenure] as tourism ministry, in order to avoid state companies going into the dollar black market, I have obtained dollars for the state from one state company to another, the tourism industry, and various private parties,” Adeeb said. Adeeb claimed to have arranged for local businessmen to purchase treasury bills worth MVR800 to 900 million as of October 2013 to ease the government’s cash flow problems. The agreement between MMPRC and MPL was approved by the respective boards of the state-owned enterprises, the ruling Progressive of Party of Maldives’ (PPM) deputy leader stressed. The MVR77 million from MPL was not embezzled or misappropriated, he insisted, claiming that the government routinely converts rufiyaa into dollars through private parties. On the allegation that the tourism ministry awarded an italian-owned company an island for resort development to pay back US$2.25million of the US$6million MMPRC owed to MPL and MTDC, Adeeb claimed that Dhaalu Maagau was used as a picnic island by PPM MP Ahmed Nazim’s friends. The former deputy speaker of parliament had repeatedly sought to secure the island, Adeeb said, dismissing the allegation that the Italian paid the lease rent for the island through Adeeb’s father’s Montillion company. Adeeb also pledged to release his financial statement to the media on Sunday (November 2) and denied failing to declare assets. According to the audit report, Adeeb has failed to declare assets as stipulated by Article 138 of the Constitution since he was appointed tourism minister in 2012. When the US$6 million corruption scandal first surfaced in May, Adeeb told Minivan News that the “defamation attempt” was linked to his refusal to support certain individuals for speaker and deputy speaker of the 18th People’s Majlis. Minivan News understands MP Ahmed Nazim was involved in leaking documents related to the case to online news outlet CNM, which first broke the story of the Anti-Corruption Commission (ACC) investigating the transactions. Nazim’s passport was withheld last week, but he left the country on the date the court order was issued. In May, Adeeb confirmed to Minivan News that two repayment cheques dated May 10 and 15 bounced due to insufficient funds. The MTDC’s US$1 million had been reimbursed, Adeeb said, while MPL had been paid one-third of the owed amount in dollars. The remaining two thirds are due in June, he added. At last night’s press briefing, Adeeb alleged “extraordinary ties” between Nazim and Auditor General Niyaz Ibrahim. Following his refusal to support Nazim for the deputy speaker’s post, Adeeb said Nazim threatened to put out audit reports implicating him as well as family members in corrupt dealings. Moreover, the auditor general’s office neither sought a statement from him nor posed any questions regarding the transactions, Adeeb said. “I am most saddened that professionals, specialised people, are brought in between our political rivalry in the political arena,” he said. The opposition Maldivian Democratic Party (MDP) meanwhile released a press statement yesterday condemning the government’s “unconstitutional” and “unlawful” attempts to replace the auditor general before the end of his seven-year term. Last week, parliament passed amendments to the Audit Act requiring the president to reappoint an auditor general within 30 days of ratifying the amendments. President Abdulla Yameen ratified the amendments on Thursday. The MDP contended that the auditor general could only be removed from office through the process specified in the Constitution, which was “(a) on the ground of misconduct, incapacity or incompetence; and (b) a finding to that effect by a committee of the People’s Majlis, pursuant to article (a) and upon the approval of such finding by the People’s Majlis by a majority of those present and voting, calling for the Auditor General’s removal from office”. The attempt to remove the auditor general shows the level of corruption in the current administration, the press release stated, adding that the government was undermining independent institutions. 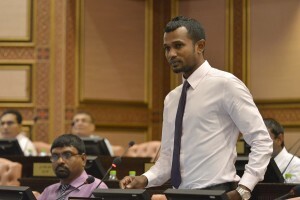 Parliament today approved an amendment proposed by Progressive Party of Maldives (PPM) MP Ahmed Thoriq to the Audit Act enabling the president to reappoint the auditor general – four years before the end of the incument Niyaz Ibrahim’s seven year term. Following the presentation of a report (Dhivehi) by the economic affairs committee to the People’s Majlis floor after reviewing amendments submitted by the government to the Audit Act, Thoriq proposed adding a clause stating that the president shall nominate for parliamentary approval an individual or individuals to the post of auditor general within 30 days of ratifying the amendments. Thoriq’s amendment – seconded by PPM MP Ibrahim Didi – passed with 36 votes in favour and 22 against while opposition Maldivian Democratic Party (MDP) MPs protested vociferously, contending that the amendment was unconstitutional. The amendments should not have been put to a vote as it allows the dismissal of an incumbent auditor general without following the constitutional process for impeachment, opposition MPs argued. Thoriq’s amendment was added to revisions to the Audit Act submitted on behalf of the government by PPM MP Ibrahim Waheed to bring the 2007 law in line with the Constitution adopted in August 2008. The legislation was part of a raft of bills submitted by the government to abolish provisions in conflict with the new constitution. Waheed’s amendments did not include revisions to sections dealing with the appointment and dismissal of the auditor general. However, he added, the amendments submitted by the government do specify the criteria. “The current auditor general is competent. I wish and believe as well that when this amendment is passed and ratified his name will be sent for our approval,” he said. However, MDP MPs insisted that the purpose of Thoriq’s amendment was replacing the current auditor general. The amendment bill – with Thoriq’s amendment – was passed with 40 votes in favour and 25 against. The 17th People’s Majlis unanimously approved former President Mohamed Nasheed’s nomination of Niyaz Ibrahim to the post of auditor general in May 2011. During a meeting of the public accounts committee last week with Niyaz and Finance Minister Abdulla Jihad concerning the audit office’s budget for 2015, Thoriq alleged that 60 percent of audit office staff were unhappy with Niyaz’s leadership. Thoriq also accused the auditor general of releasing a damning audit report of the finance ministry ahead of the parliamentary polls in March and withholding reports exposing corruption in the MDP government. In response, Niyaz said he was not surprised that employees of the audit office met politicians to complain about the auditor general, contending that some staff members were unhappy with stricter workplace regulations. A timetable or schedule for publishing audit reports has been shared with the public accounts committee, he noted. Moreover, the majority of audit reports released during his tenure were of government ministries and state institutions under the administration of former President Mohamed Nasheed, Niyaz observed, adding that it was used as “campaign material” against the MDP presidential candidate during last year’s presidential election. Niyaz was appointed to the post following parliament’s dismissal of former Auditor Ibrahim Naeem in March 2010 in a no-confidence motion. Naeem was accused of corruption by the Anti-Corruption Commission (ACC) of using state funds to buy a tie and visit Thulhaadhoo in Baa Atoll. Naeem had claimed the charges were an attempt to discredit his office and prevent him from reclaiming the government’s money stored in overseas bank accounts. “A lot of the government’s money was taken through corrupt [means] and saved in the banks of England, Switzerland, Singapore and Malaysia,” Naeem told the press ahead of the no-confidence vote. The Ministry of Fisheries and Agriculture has denied allegations made by Auditor General Niyaz Ibrahim in a letter to parliament’s public accounts committee. Niyaz had informed the oversight committee that his office has been unable to complete the audit of the ministry for 2009 due to missing documents. At a press conference today, Permanent Secretary Abdulla Naseer said all documents requested by the audit office were provided following a request on August 29, 2013. He added, however, that the ministry was unable to find six payment vouchers. In addition, employees did not submit travel reports for 10 overseas trips in 2009, Naseer continued, which were among the documents the auditor general claimed were missing. Meanwhile, in his letter, Niyaz told MPs that the audit office has decided to conduct a compliance audit of the ministry for 2009 in lieu of a full financial audit. The Auditor General’s Office has questioned the valuation of assets of the Thilafushi Corporation Ltd (TCL) and State Electricity Company (STELCO) in audit reports of the state-owned enterprises for 2013. The TCL audit report released last week explained that the Finance Ministry transferred land and buildings on Thilafushi Industrial Island to the corporation at a value of MVR12 billion (US$778 million). “The consideration for such transfer had been made by the issue of 150,000,000 equity shares of MVR10 each issued at a premium of MVR74.13 to Ministry of Finance and Treasury,” the report stated. Following valuation of the island and property therein by a professionally qualified party “on the basis of capitalised lease rentals to perpetuity,” the leased land was valued at MVR5,725 (US$371) per square foot. The report also noted that MVR33 million (US$2 million) was paid to Heavy Load Maldives for land reclamation, which was stated in the balance sheet as capital work in progress. However, in 2011, the company incurred a further MVR23 million (US$1.4 million) for the project, increasing the total capital work-in-progress amount to MVR61 million (US$3.9 million). Auditors found that the MVR23 million had been “capitalised by transferring the amount from capital work-in-progress to land towards the industrial zone reclamation,” while the remaining amount had not been capitalised. “In the absence of evidences supporting the work done for the remaining amount of MVR38,889,767, we are unable to conclude whether the company has received value for the amount paid and therefore whether the capital work-in-progress has been fairly stated,” the report concluded. In January 2013, local media reported that TCL incurred MVR650 million (US$42 million) worth of losses as a result of Heavy Load not reclaiming the agreed 152 hectares of land within the granted six month period. As a result of the issues flagged in the report, the audit office was “unable to obtain sufficient appropriate audit evidence to provide a basis for an audit opinion,” and subsequently did not express an opinion on TCL’s financial statement. In the audit report of STELCO for 2013, the audit office noted that while the company’s financial statements gave “a true and fair view” of its financial position, performance and cash flow as of December 31, 2013, Auditor General Niyaz Ibrahim qualified his opinion due to questions over the valuation of assets. The report explained that the government-owned company’s property, plant and equipment were revalued by an external valuer during 2011. “Accordingly, the assets having net book value of MVR434,455,893 [US$28 million] as at 31 December 2011 were revalued for MVR847,932,997 [US$54 million] and a revaluation surplus of MVR413,477,104 was recognised in the books of account,” the report revealed. However, it added, assets worth MVR26 million (US$1.6 million) were excluded from the revaluation report and “the company accounted these assets at their respective net book values based on historical cost,” which was in violation of international accounting standards. However, the construction had been discontinued since 2010 “due to a dispute with the constructor,” auditors found. “Further, we were not allowed to access the premises of the tug boat. Hence, we are unable to satisfy ourselves regarding the physical existence and recoverability of the asset,” the report stated. Functions of the ruling Progressive Party of Maldives (PPM) held at the official presidential residence Muleeage are not funded from the state budget, President Abdulla Yameen has said. Speaking to the press at a PPM event in Muleeage on Thursday night (June 5), President Yameen reportedly said he did not believe using the official residence for meetings or party activities amounted to misuse of state resources. The president’s remarks followed Auditor General Niyaz Ibrahim’s insistance last week that state property could not be used for party activities. Niyaz told local media that Muleeage could only be used either for functions held by the president or the first lady in their official capacity or for meeting invited guests. Recent signing ceremonies to welcome high-profile new members to the ruling party – most recently Independent MP Abdulla Khaleel and Environment Minister Thoriq Ibrahim – have been held in Muleeage. President Yameen told reporters Thursday night that while he respected the auditor general’s opinion he did not believe using Muleeage for party functions was a problem. “No money from the government’s budget or Muleeage budget is spent for any work done here. If there’s a tea or anything else here, we make the expenses outside the budget. So this is not a resource that is consumed,” Yameen was quoted as saying by newspaper Haveeru. “If expenses are not made from the government budget, it would be best if the place [Muleeage] is not made too much of an issue,” he suggested. After assuming office in November, President Yameen had announced that he would continue to live in his private residence. However, the budget allocated for the official residence was increased by MVR2 million (US$130,208) in the state budget for 2014 – rising to MVR19.1 million (US$1.2 million). In April this year, parliament approved amendments to to the law governing renumeration and benefits for the president and vice president making it mandatory for the state to cover expenses of the pair’s private residences should either choose not to live in the official residences. Meanwhile, the PPM also put out a press statement last week contending that the auditor general’s remarks were biased, misleading and politically motivated. “This party’s activities have not been held in the president’s official residence Muleeage so far,” the party claimed. Alleging that a number of party activities and functions – without the participation of the president – had been held in Muleeage during the administration of former President Mohamed Nasheed, the PPM noted that “the auditor general had not said anything about it” at the time. The press release went on to criticise the auditor general for not objecting to political party activities allegedly held at the Malé City Council premises as well as the use of the Dharubaaruge convention centre by protesters of the opposition Maldivian Democratic Party (MDP) in the wake of the controversial transfer of power in February 2012. “Therefore, as this party believes that the interviews given by the auditor general to the media saying that the president’s official residence is being used for this party’s activities were biased and political, we express deep concern about the matter,” the press release stated.